Since no liquids are used, it involves no mess. The practitioner is able to see exactly what’s happening in the ear canal, helping make this the safest method of removing wax. It is generally more comfortable than syringing. It doesn’t usually require the use of oil beforehand, so can be carried out as a ‘walk-in’ procedure. Being a safer and gentler process than syringing, it can be repeated more often, making it ideal for people who suffer regularly from excessive wax. It can be performed safely on patients for whom syringing is not an option: those with perforated eardrums or who have a history of ear surgery. Traditionally, this has been the standard procedure for wax removal, most commonly performed by the practice nurse at the local GP’s surgery. The patient will usually be required to soften the wax first using oil, possibly for several weeks if the blockage is particularly hard and compacted. A jet of water at body temperature is aimed behind the blockage to loosen it and wash it out of the ear canal. In extreme cases, multiple appointments may be necessary to remove the wax completely. A small number of practices still use the old-fashioned metal syringe to carry out the procedure, but increasingly these are being replaced by irrigation machines, which allow the practitioner to control the water pressure more accurately. Many patients find it physically unpleasant or even painful. As it involves the use of water, it can be messy. The procedure can cause undesirable side effects, such as dizziness, tinnitus, external ear infections or even perforation of the eardrum. 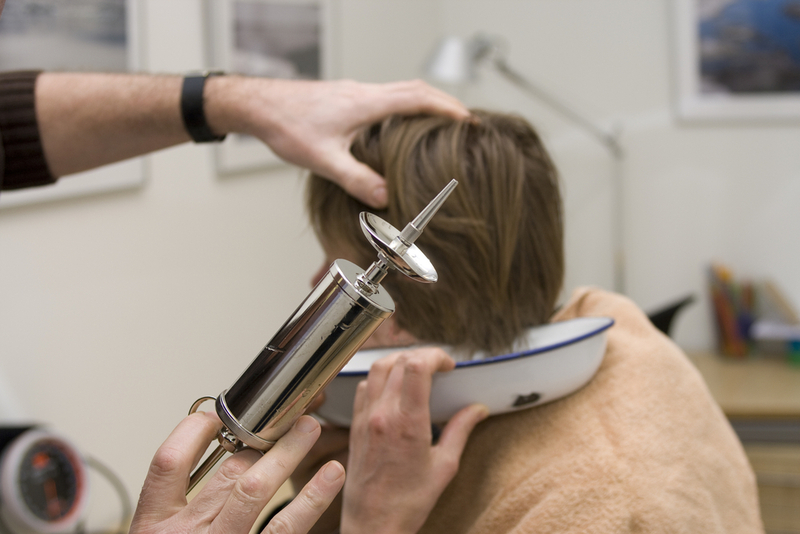 As it can cause trauma to the delicate structures of the ear, many GP’s practices will be reluctant to carry out the procedure on the same patient repeatedly. The nature of the procedure renders it unsuitable for a relatively large number of people: those who have – or have had – a perforated eardrum; those prone to external ear infections; those who have undergone ear surgery (eg. myringoplasty,grommets). Since it doesn’t constitute an item of their ‘core contract’ (ie. it’s not a service they are obliged to provide), many GP’s practices simply refuse to do it – especially in light of the associated risks – leaving patients to suffer the problem or await referral to ENT at the local hospital. Castle Hearing provides a wax removal service by microsuction at our Dumfries clinic. Our state-of-the-art facilities ensure a safe, comfortable environment, where our audiologists can perform a free examination and offer professional, impartial advice on the health of your ears. 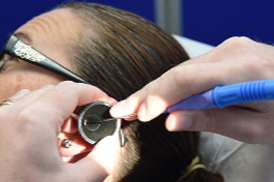 If appropriate, we can remove excessive ear wax at a cost of £40 for one ear and £60 for two. We routinely take before and after photographs by video otoscopy, allowing you to see the results for yourself. In addition, we provide ongoing aftercare, with free six-monthly check-up appointments to ensure that any further buildup of wax doesn’t become a problem again. Phone us or fill out an online form to book a free consultation today.